Almost 130 people attended the very elegant and enjoyable event “Arias at Sea” aboard Holland America’s ms Westerdam at Port Everglades on Saturday, March 21st. 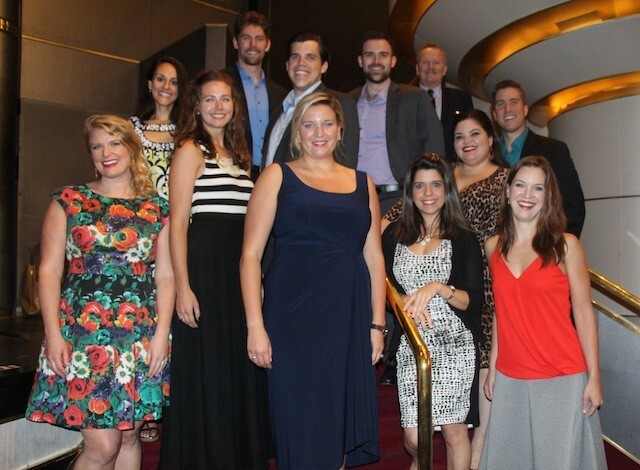 Guests were treated to the beautiful performances of eleven of Florida Grand Opera’s Young Artists while sipping champagne and mimosas in the beautiful ship’s show room. Justin Moss, in his inimitable style, provided the introductions for each of the singers and their selections. Following the performances, a superb luncheon was served by the ship’s staff. The food and service were absolutely first class. A brief business meeting was held for the election of officers. The elected candidates were congratulated by all. Next came the raffle drawing. The raffle prizes, two Florida Grand Opera subscriptions for next season and a cruise certificate from Holland America Lines for up to seven days for two people aboard any Holland America ship to Alaska, the Caribbean, Mexico or Canada/New England delighted the winners! Comments from all the guests were uniformly enthusiastic and The Opera Society looks forward to repeating this wonderful event next year. This event was very successful in raising funds for Florida Grand Opera thanks to the generosity of Holland America Lines with their much appreciated community outreach, support and the donation of the cruise certificate; to Coldwell Banker Cares Foundation for their generous donation towards the event and to the dedication and hard work of many of The Opera Society’s board members. Betty Young provided all the great photos. Previous post: St. Patrick’s Day – Erin Go Bragh! Next post: The Opera Society Goes To Boca!